One more Elementary project completed! 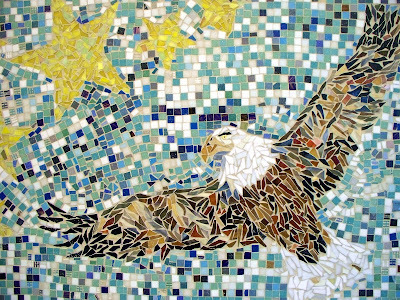 This 3x5' panel is titled "Soaring Eagle, Shining Stars". 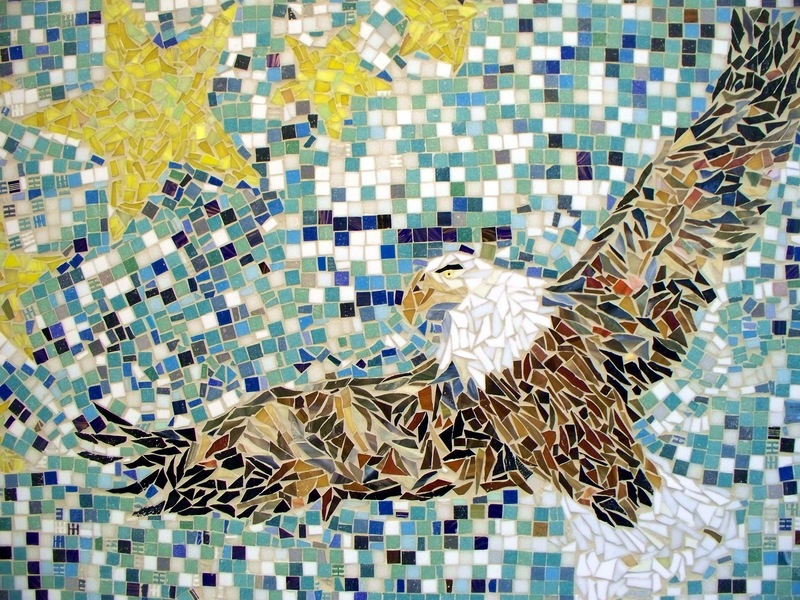 The school recently changed their mascot from stars to the eagle with some reluctance. So, we created a mosaic that shows both, and the 5th graders I worked with were super! Like the klutz that I am, I tripped over one of the low seats in the cafeteria as I was leaving the first day, landed on my back like a turtle, and amazingly not one student laughed. In fact, several jumped up to see if I needed help and was OK. On the way home I chuckled to myself and thought that maybe they were worried that if I was hurt, I wouldn't be able to come back to finish the mosaic with them... In any case, I know my own children would have laughed for hours... replayed it in slow motion, and logged it in their funny family story memory bank for some unfortunate unsuspecting moment of recall. Thank you students for your caring and creativity! If you're looking for a way to get in the holiday spirit, share an activity or talent, or just want a pre-holiday boost of amazing energy and spirit, contact your local school (extra plug for public school!) for their next concert or holiday event. No doubt they need some extra hands, funds, attendees, organizers, volunteers, and cookie bakers. Sharing your time, as well as talents this time of year is always a great way to give to your community. You never know how much your small gesture (or large) can make an impact on someone else. OK, so I know kids can be loud, messy, sticky, strange, goofy, and many other wild and wonderful things, but you can handle it for an hour, a couple of hours, or maybe you'll even enjoy it! Just pace yourself, and say YES to the opportunities that you enjoy. Schools and our kids in schools NEED every bit of help they can get! The days of the little red one room school houses are gone, but it's still vital that communities come together to support young people and learning. Make it fun, make it a holiday gift to yourself. My youngest son is turning 12 tomorrow. We had 10 middle school age boys over Fri nite for good old fashioned at home, playing in backyard, pizza, and birthday cake party... complete with some neighborhood girls just *coincidentally* casually strolling by our house. Sunday was his family dinner party. But, tomorrow is officially the day... 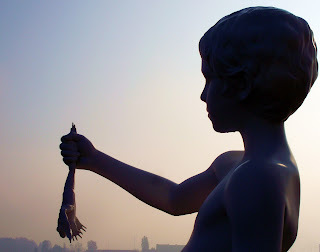 This photo is of a gorgeous Venetian sculpture in pure white marble, about 8 feet tall, outside at the very tip of a peninsula along the Grand Canal. I photographed it at every angle, this side, in shadow, is my favorite. The fog was condensing on the smooth surface, creating what looks like sweat dripping off his chin. Ahh boys.... (at least I can't smell his feet)! 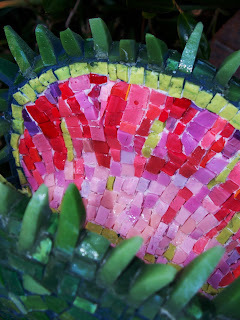 If you've been reading recently, you know I went to Italy for a mosaic course in Ravenna. 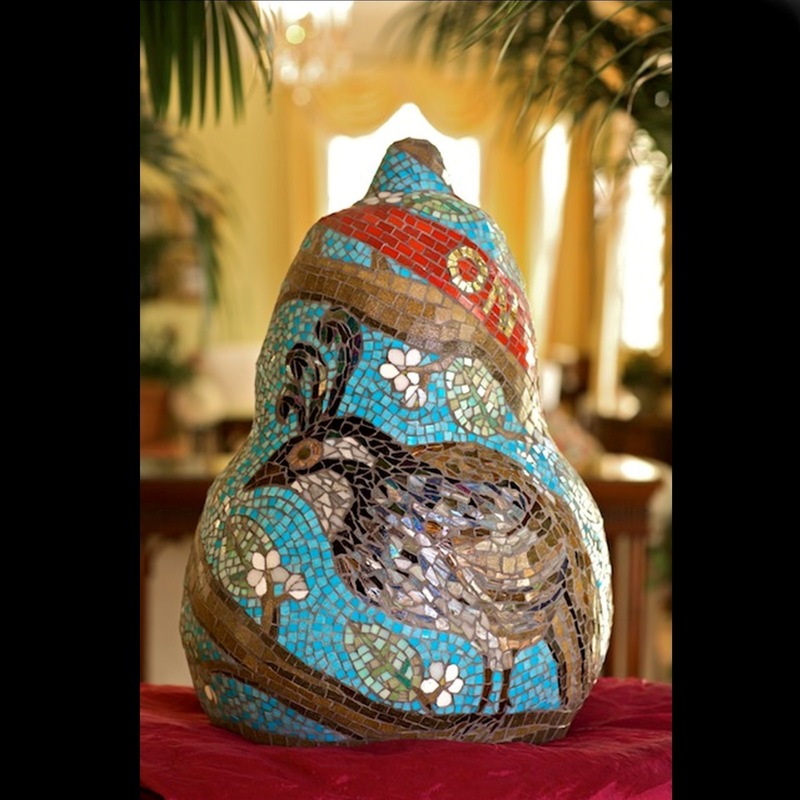 The course was with Luciana Notturni at her Mosaic Art School. She is an expert in ancient mosaics, utilizing traditional techniques and tools. She also creates modern mosaic works, architectural, sculptural, and fine art wall hangings. It was a special week to be able to learn from her how to cut smalti with a hammer and hardie, traditional tools I had not tried before in my years of mosaic making and experimenting. I signed up for her 3D mosaic course, since that is one direction my own personal work has taken in the last 5 years after a wonderful sculptural workshop with Sherri Warner Hunter. 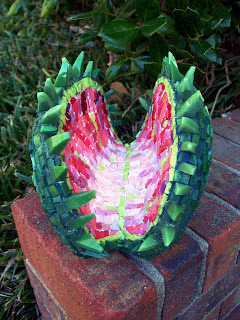 I decided on a Venus Flytrap for my project, small enough to finish during the week, but with some intricate details that needed some special attention. Unfortunately it was damaged in my travels home, but I was able to repair it this week. I have plans to collaborate with an engineer friend in order to realize a kinetic 6' version soon.